If you’re one to regularly check in here on the Inside the Gig blog— which we always recommend you do!— you may have seen a recent “how-to” article geared toward our Lite members. In it, we explored the significance of selecting the right categories and what impact these labels actually have on your search results rankings (and, of course, how to go in and select different categories in your MCP). But after thinking more on the overall importance of category selection, it occurred to us: this is subject matter that every member should be educated on. 1. True or False: The categories you list in have a direct impact on your search results rankings. 3. True or False: It’s better to opt for the most specific category possible when choosing your primary category. 5. True or False: The more categories you list under, the more chances you’ll have to appear on a wider variety of search results pages. Many of you are already aware that there’s an algorithm that fuels our search results pages. Factored into that formula is a wide variety of elements, including the categories you list in. Your Primary Category, in particular, is a chief component to your individual ranking. That’s why it’s critical that you match that category up with one that’s keyed in often on search engines like Google and Bing, as well as directly on GigMasters. Only Lite members are limited to two categories. 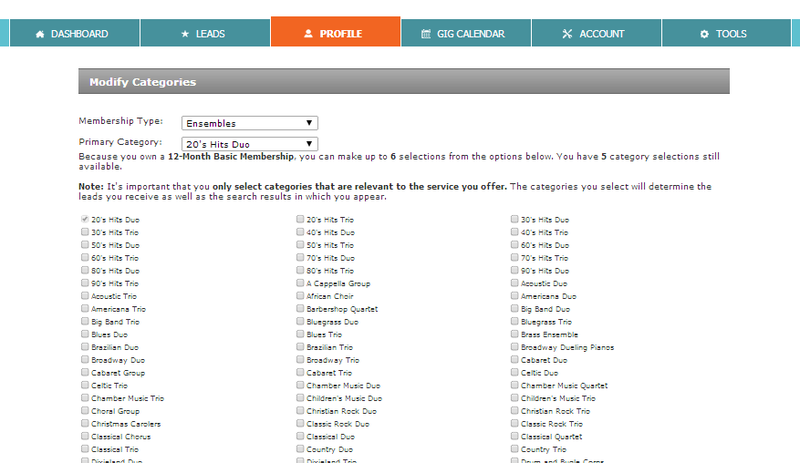 Basic members can select up to six categories while Pro members get double that amount with a category total of 12. Only Gold members are given the option of listing in 18 categories. Put yourself in the client’s shoes. 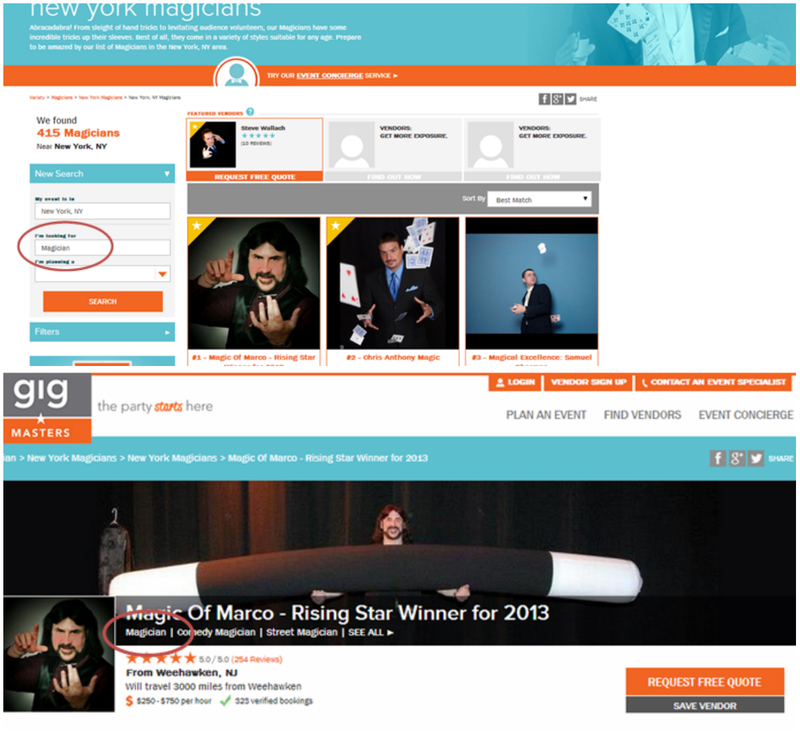 If you’re looking to book a magician for a kid’s party in Austin, chances are you’ll type into Google some combination of the terms “kid friendly,” “birthday party,” “magician,” and “Austin.” So while you may technically be a “comedy magician,” keep in mind the fact that many clients out there might not initially think to search for something that precise. Of course, you absolutely should zero in on any and all applicable, genre-specific labels when selecting your remaining five, 11, or 17 categories. Once there, simply click on the “Edit” button alongside “Category Options” to view a full listing of the category options available. Once you’re finished selecting new or different categories, hit the “Update Categories” button to save your changes. So how’d you score? If you aced it with a 5 out of 5, consider yourself a category expert (then go home and post this up on the refrigerator for all to admire!) But if any of the questions had you at all unsure about categories and how they work, then you may want to take a few notes on the points we reviewed here. And, you can always call one of our helpful Account Specialists (866-342-9794) for a quick tutoring session. In the end, we understand that with all the competition out there, increasing the amount of traffic that reaches your profile can be downright difficult. That’s why we’re revealing this dynamic piece of the puzzle, so that you can act accordingly and secure your profile the maximum exposure it deserves. Mark this down as another course completed at the GigMasters Academy!